The property offers 8'000 m² of fenced wood on a hill on the northern coast of Sicily, a few km from the town of Cefalù, close to Lascari. A quite and charming place. The house is built in the typical style of rural Sicily, simply and tastefully furnished, surrounded by trees and a flowering garden - with a lovely private pool (6x12 m). The entrance, over a terrace facing the coastline and the Tyrrhenian sea, with a large marble table under the oaks branches; the fully-equipped kitchen area, living-dining room, full bathroom with shower/WC, bright mezzanine with double bed and romantic window; outdoor kitchen with bbq and dining area. A few steps lead to a the sleeping area with a twin-beds room, bathroom with tub/WC, a double-bed room with French door leading to the large covered terrace with an other large marble table facing the private swimming pool. Finally, a small area with bathroom with shower/WC, and a top terrace with panoramic view of the sea. The area is tranquil and safe. It is possible to sleep with open windows, since all are provided with mosquito nets, which make it possible to enjoy the fresh nights of the countryside. A short drive from the shops and restaurants of Lascari (2,5 km), the property is near a beautiful sandy beach (7,5 km), close to the spectacular centre of Cefalù (15 km), not far from Palermo (60 km): it's definitely a strategic base-camp to visit the whole Sicily: 230 km from Taormina, 160 km from Agrigento, 210 km from Syracuse, 180 km from Marsala. The Tyrrhenian Coast of Sicily: visit Cefalù, and enjoy the other beautiful beaches of the coast between Cefalù e Capo d’Orlando. But the charm of the island is not only in its coastline: dip into the hinterlands to discover the ancient towns on the Madonie mountains such as Gratteri, Castelbuono, Gangi, Polizzi Generosa, le Petralie. These villages evoke the Middle Ages and the fiefdom of the ruling Ventimiglia families who ruled over post-Angevin Sicily. It is an unexpected side of Sicily and there is no better place to picnic in the summer. Southern Sicily: Agrigento. Boasting the largest and greatest collection of ancient Greek ruins in the world, the Valley of the Temples, just outside the city of Agrigento, opening onto the Southern coast of Sicily, is one of the most memorable and evocative sights of the ancient world. The temples are stunning and the most impressive ones are those dedicated to Juno (from the mid-5th c. B.C.) and to Concord. Concord is the most magnificent of all, with 13 wind-eroded columns still standing. Eastern Sicily: Taormina. Famous for its mild climate, arguably the most beautiful town in Sicily is visited by travellers coming from all over the world to see its maginificent Greek theatre facing Mount Etna and the Ionian sea. Western Sicily: the town of Marsala presents a mesmerizing landscape thanks to its Phoenician salt flats (still in use for the production of salt) and wind mills. In the town centre, it is possible to visit winehouses where to taste the world-famous Marsala wine. When in western Sicily, don't miss the small medieval town of Erice, with its cobblestone streets and stunning sea views from the castle. My name is Benedetta and I come from Palermo. I enjoy travelling and getting to know new places and cultures. I love nature and I am very environment-savvy, so I promote an environment-friendly lifestyle. This villa is not just a property for me. It is my beloved old family house, where I've spent the best times of my childhood and where I still turn to when I need to enjoy a moment of peace and relax in the green nature. This house means so much to my family, my friends and myself, and I like to share this feeling with all my guests. What makes our house unique is that it is not a cold, un-lived rental property. It is a family home where we stay for several weeks ourselves, which means that my guests will find everything necessary to spend a comfortable stay, and much more. I provide bathroom towels, but NOT seaside or pool towels. There are two kitchens: an indoor kitchen, and an outdoor kitchen on a terrace with a large marble table and barbeque. The private pool is 6 x 12 m wide with a jumping board and an automatic cleaning system. The house offers the warm charme of an old country house combined with all the modern comforts. As my family usually enjoys the house during the weekends, when it is available, as base-camp for short trips around Sicily, it is equipped with everything a family can need, and more. Several books provide a very special resource for information about the art and architecture of the area. This was a lovely villa in the countryside 5 minutes out of Lascari. The pool was a great bonus - big enough for laps and water battles with the kids - one of the cleanest we've ever come across. As it was incredibly hot (38-42) went spent most of the time in the shade by the pool relaxing.There were numerous terraces with either views of the bay or shade. Close to local amenities (the bakery in the village was fantastic) and attractions. We did a lovely walk up Mount Carbonara as well as shopping in Cefalu, roman ruins and palaces in Palermo. Something for everyone with all the facilities you'd need with rustic charm. Benedetta and her family were very helpful and being escorted to the villa was a great improvement on driving around trying to find it as we normally do with the "clear instructions" provided by owners. Would highly recommend this villa. Everything is already said about the villa in all the other reviews. We can only agree. It is a lovely house and a lovely place. We were welcomed with great warmth by Francesca and Benadette. It is their family house, and they are proud of it and take really good care of the house. For us It felt like home away from home and we hope to return next year. This is a totally charming family house in hilly countryside overlooking the Gulfs of Palermo and Termini Imerese and the Madonie mountains. It encapsulated quiet seclusion away from the coastal strip and yet was still very close to shops in Lascari or main transport links. It is well equipped with many thoughtful touches and was beautifully clean. We too had a warm welcome from Benedetta and Francesca and a lovely "starter pack" of fruit and wine. The owners were always available by phone should any problem crop up. Other writers have waxed eloquently about the terraces and following the sun during the day for various meals (not easy for those of us who live in Wester Ross!) and the views night and day are truly stunning. As serious swimmers, the pool deserves special mention. It is of a size, shape and depth that unusually actually permits one to swim -( unlike the overblown paddling pools one meets elsewhere.) It was sparkling clean. Francesca's recommendations for shops in Lascari were extremely helpful and we found the local folk friendly and helpful. We particularly enjoyed the access to the Madonie Mountains - utterly charming hill villages and plenty of trails and mountains to climb of varying difficulty. ( For those unable to travel to Mount Etna, there is line of sight from the top of Pizzo Carbonara. ) The mountains are virtually yours in September and for those of us a bit slain by the heat, there is an 11 degree difference in temperature between the summits and Lascari - enjoy! There is good access to main routes and the Valley of the Temples is unforgettable (the A 19 is closed for a large section with involved detours and we believe this situation will remain for some time.) We received good advice beforehand to always set off early for the more famous sites (including Cefalu) and this proved true. We have been renting holiday houses in Europe for the last forty years and this house is definitely one of the most special. We would love to return (so much more to see and do) and would not hesitate to recommend it to others. We had such a happy holiday and now have the happiest memories of a super place and kind, friendly people. A warm family house, secluded and private. Plenty of room to spread out and options to eat. Super-warm, deep pool with diving board just delightful but this along with the many steps means care with young children. Good for a host of pretty hilltop towns, Cefalu and the beach; Agrigento and the Valle di Templi quite do-able (but get up early); just a bit too much of a stretch to Etna for us. Towels not in abundance - if you like your big swim towels talk to the owner beforehand perhaps or take some with you. A warm and friendly welcome from the owner's mother showing us her family home - it felt right and we had a fabulous time. This house is one of the best places we've ever been to. After a warm welcome of the owner, we ( a family of 3) had the best start of our holiday one could wish for. The house is very well maintained with, the kitchen extremely well equipped. Using the outdoor kitchen and BBQ makes cooking a feast. The villa is perfect for a quite relaxing holiday, thanks to the great pool and several terraces. It has been our 3rd time we've visited this villa and we will definitely return soon. Many thanks Christian for giving 5 stars to my property! And for your kind words as well. Families coming back again are the best reward to my effort to make their stay in my villa a great experience. See you soon. Three generations, from age 7 to 79, enjoyed a wonderful week at this lovely house. Our flight was delayed but we were met cheerfully at gone midnight and presented on arrival with a really lovely cold supper of local pizza, meats and cheeses. We were helped through the week with recommendations for shopping and restaurants. The house was very comfortable and well equipped, with beautiful views, and good space inside and out. The children loved the pool, particularly as it had a diving board. Perfectly located in the cool and quiet of the hills yet minutes from beaches and restaurants, and the fantastic town of Cefalu. We loved it. Many thanks, Nichola, for your 5 stars and for your enthusiastic words about your experience with my villa. It is our family country house where we spend several weekends during the year, so we maintain it with love and care, in order to find it always read to welcome us for our short escapes from the town. I really love to share it with people from other countries, because if they choose my house among the thousands properties offered in Sicily, they are in some way similar for taste and preferences to me: they are not just paying guests, but friends worth a warm welcome in a place where they can definitely feel at home. 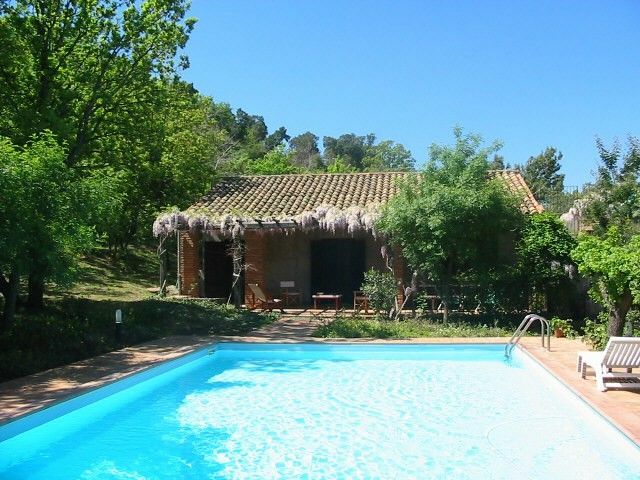 The property, in the Cefalù area, is very close to the small town of Lascari, just 2,5 Km. Cefalù city centre is 15 Km from the property. An impressive rock dominates this charming little North coast town, one of the most ancient Greek towns in Sicily, rebuilt in the Norman period by King Ruggero II. It offers one of Sicily's most magnificent Norman cathedrals known for its grand array of Byzantine-Norman mosaics completed in 1148. It also offers a wonderful long beach which attracts large numbers of travellers from all over the world. Cefalù is very close to the large protected area of Parco delle Madonie, Sicily's greatest national park, which offers a unique landscape as well as the possibility to go hiking and enjoy an unusual aspect of Sicily.